On Friday, Big Dada let go a first free download tune (»Butterfly Crab Walk«, listen and download below) from the upcoming Roots Manuva meets Wrong Tom LP »Duppy Writer«. actually a collection of reworks by Wrong Tom. The Staines-based DJ/producer, who has worked with Pama International, Trojan and, er, Hard Fi, contacted Big Dada to ask if he could fashion a dub version of Roots Manuva’s single »Buff Nuff«. Impressed with what he turned out, Big Dada commissioned a series of mixes which became the bonus disc on the limited edition version of Roots’ Slime & Reason LP. There’s also a brand new collaboration between Roots Manuva and Ricky Ranking, »Jah Warriors«, which will be released as single. 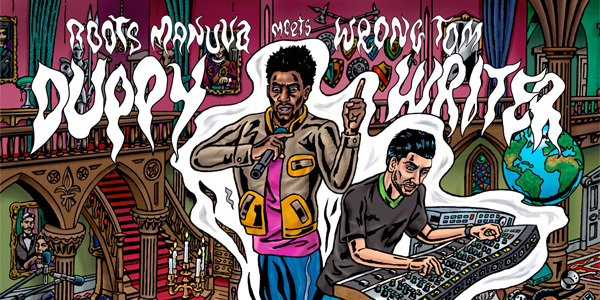 Roots Manuva meets Wrong Tom »Duppy Writer« is about to be released on September 9th.